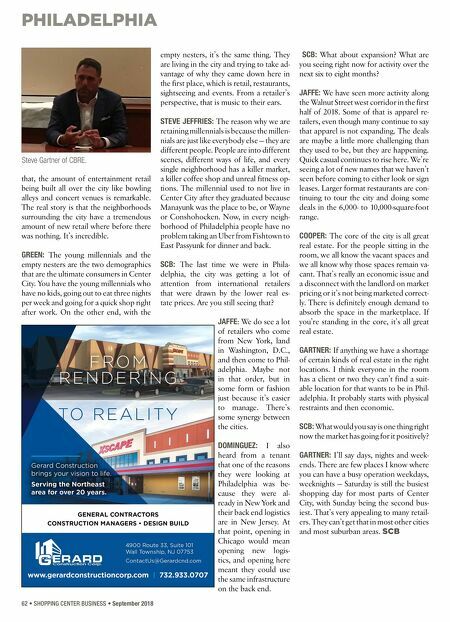 PHILADELPHIA 62 • SHOPPING CENTER BUSINESS • September 2018 that, the amount of entertainment retail being built all over the city like bowling alleys and concert venues is remarkable. The real story is that the neighborhoods surrounding the city have a tremendous amount of new retail where before there was nothing. It's incredible. GREEN: The young millennials and the empty nesters are the two demographics that are the ultimate consumers in Center City. You have the young millennials who have no kids, going out to eat three nights per week and going for a quick shop right after work. On the other end, with the empty nesters, it's the same thing. They are living in the city and trying to take ad- vantage of why they came down here in the first place, which is retail, restaurants, sightseeing and events. From a retailer's perspective, that is music to their ears. STEVE JEFFRIES: The reason why we are retaining millennials is because the millen- nials are just like everybody else — they are different people. People are into different scenes, different ways of life, and every single neighborhood has a killer market, a killer coffee shop and unreal fitness op- tions. The millennial used to not live in Center City after they graduated because Manayunk was the place to be, or Wayne or Conshohocken. Now, in every neigh- borhood of Philadelphia people have no problem taking an Uber from Fishtown to East Passyunk for dinner and back. SCB: T he last time we were in Phila- delphia, the city was getting a lot of attention from international retailers that were drawn by the lower real es- tate prices. Are you still seeing that? JAFFE : We do see a lot of retailers who come from New York, land in Washington, D.C., and then come to Phil- adelphia. Maybe not in that order, but in some form or fashion just because it's easier to manage. There's some synergy between the cities. DOMINGUEZ: I also heard from a tenant that one of the reasons they were looking at Philadelphia was be- cause they were al- ready in New York and their back end logistics are in New Jersey. At that point, opening in Chicago would mean opening new logis- tics, and opening here meant they could use the same infrastructure on the back end. SCB: What about expansion? What are you seeing right now for activity over the next six to eight months? JAFFE: We have seen more activity along the Walnut Street west corridor in the first half of 2018. Some of that is apparel re- tailers, even though many continue to say that apparel is not expanding. The deals are maybe a little more challenging than they used to be, but they are happening. Quick casual continues to rise here. We're seeing a lot of new names that we haven't seen before coming to either look or sign leases. Larger format restaurants are con- tinuing to tour the city and doing some deals in the 6,000- to 10,000-square-foot range. COOPER: The core of the city is all great real estate. For the people sitting in the room, we all know the vacant spaces and we all know why those spaces remain va- cant. That's really an economic issue and a disconnect with the landlord on market pricing or it's not being marketed correct- ly. There is definitely enough demand to absorb the space in the marketplace. If you're standing in the core, it's all great real estate. 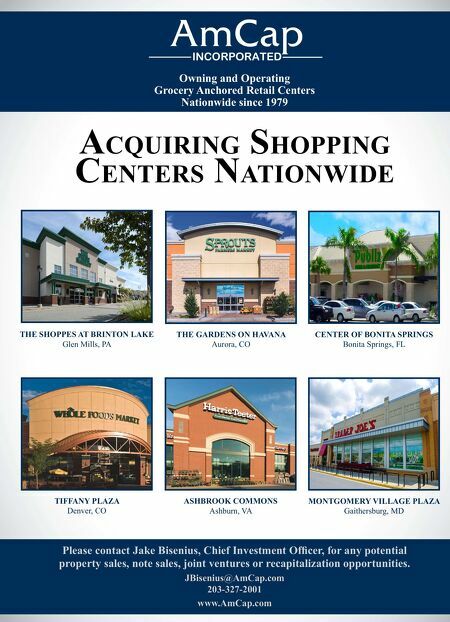 GARTNER: If anything we have a shortage of certain kinds of real estate in the right locations. I think everyone in the room has a client or two they can't find a suit- able location for that wants to be in Phil- adelphia. It probably starts with physical restraints and then economic. SCB: What would you say is one thing right now the market has going for it positively? GARTNER: I'll say days, nights and week- ends. There are few places I know where you can have a busy operation weekdays, weeknights — Saturday is still the busiest shopping day for most parts of Center City, with Sunday being the second bus- iest. That's very appealing to many retail- ers. They can't get that in most other cities and most suburban areas. SCB Steve Gartner of CBRE.